The ACS-3030 inductive pad is the offload connection for Tinytag Splash 2 and Aquatic 2 data loggers; ideal for use in wet or harsh environments, it is also compatible with the Transit 2 logger. It plugs into the PC via a USB cable facilitating the offloading of multiple loggers without the need to directly connect a cable to the logger. 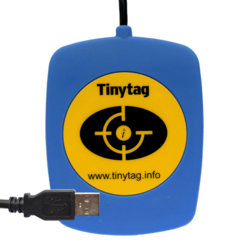 The inductive pad is also available bundled with Tinytag Explorer software as a Software Pack.